We wanted to wrap our heads around the hoo-ha about Sante Spa And Cuisine, a new restaurant that serves healthy - vegetarian food - with vegan, keto, gluten-free options. The decor, the food, the entire experience will turn into you a Sante loyalist for life! 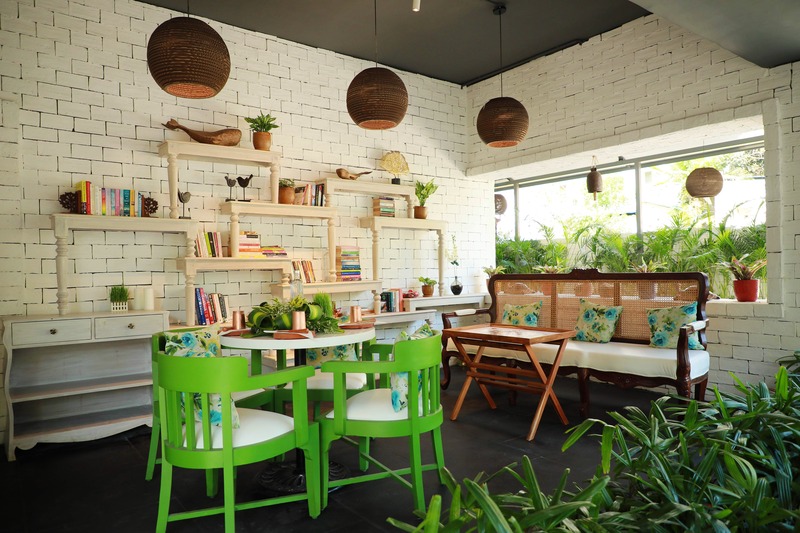 The white brick walls, green patch on the wall, the neem wood plates, copper glasses, an outdoor seating area, a bookshelf - the decor gets 100 points from us. We will be upfront about it - the menu is an encyclopedia of sorts. Check with Trivesh Marlecha and Ambika Chowgule before you select your dishes. We started with their signature Beetroot and Spinach Hommus - that resemble the ice cream from Softy Cone. This comes with khakhra. Yes, however odd this may seem - the dish is killer. Don't forget to try their Southern Spices Low Fat Cottage Cheese Saute that comes with watermelon chutney. The sweet and tangy chutney goes perfectly with the tender paneer. Their salads are a must-try. We recommend their Spaghetti Of Vegetable (super fresh and organic) which comes with pickled raw mango vinaigrette and fenugreek leaves. If quinoa appeals to your taste buds - go with the Mediterranean Quinoa. The best part about the salad bowls is that they don't fill you up. When it comes to veggies - the more the merrier. We got a half-n-half pizza with Farm Fresh and Verde - both of which came with ragi base. The next time you want to have junk (read healthy) you know where to go! Post-pizza, we went with Thai Curried Vegetables - the rice of which is Kerala brown rice. The curry is miso coconut cream. This one is gluten free and vegan, and is super tasty! Finish the meal with Salted Caramel Mud Cake - this one with all its rich gooey chocolate will leave you dizzy (in a good way). Also, try their Chocolate Matcha Truffles - little balls of joy! We would need a few more visits to try all that there is on the menu. We are also told by Trivesh that most of the ingredients come from Chennai but some are also sourced from different parts of the country. The week-old restaurant is super busy on weekends. Make a reservation before you land up there. The service is also slowly picking up. The restaurant is a tad expensive but we are ready to shell the money for healthy food.